Paris' 4th arrondissement (including the Beaubourg, Marais, and Ile St-Louis neighborhoods) is popular with both tourists and locals for a very good reason. Not only does it house some of the city's most important and beloved historical sites, including Notre Dame Cathedral and the elegant Place des Vosges, but it's also the living heartbeat of contemporary Paris. It harbors several bustling and elegant neighborhoods, attracting artists, designers, trendy shopkeepers, and students alike. Here is a taste of the eclectic blend of sights, attractions, and opportunities for shopping and cultural exploration you'll find in each of the district's three main neighborhoods. The Beaubourg neighborhood lies at the heart of the city, where you'll find some of the capital's finest museums and cultural centers, as well as vibrant cafes, restaurants, and quirky boutiques. The Centre Georges Pompidou is a modern hub for French art and culture, with several galleries and a museum, as well a public library, coffee house, and bookstore. The National Museum of Modern Art, located in the Pompidou center, boasts nearly 50,000 works of art, including one of the most important extensive and prestigious collections of modern art in the world. The Marais neighborhood ( the term means "swamp" in French) preserves the narrow streets and traditional architecture of Medieval and Renaissance Paris. It's also a prime area for nightlife in Paris and one of our favorite districts for visiting the city after dark. The St-Paul St-Louis Church, one of the oldest examples of Jesuit architecture in Paris. It was commissioned by Louis XIII and completed in 1641. The Hotel de Sens is a Medieval mansion built between 1485 and 1519 as a residence for the archbishops of Paris. It is remarkable for its interesting combination of both Medieval and Renaissance architectural elements. 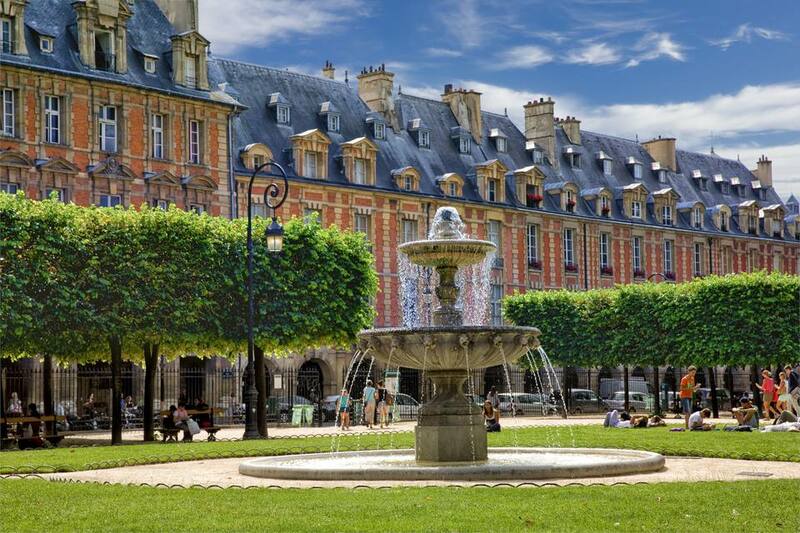 The Place des Vosges, arguably the most beautiful square in Paris, served as a royal playground for numerous monarchs of France and harbors the former residence of Victor Hugo. There is an interesting museum dedicated to the acclaimed French author at the site, the Maison Victor Hugo. Old Jewish District (Rue des Rosiers and Le "Pletzl") is the main thoroughfare for the Marais' historic Jewish quarter and well-known for its Middle Eastern and Yiddish specialties. A special treat in the area, popular with tourists and Parisians, are the excellent falafels served in restaurants on the Rue des Rosiers. "Pretzl" means "neighborhood" in Yiddish. Shoah Memorial and Museum was inaugurated in 2005, and the Shoah museum incorporates both the Centre de Documentation Juive Contemporaine (Contemporary Jewish Documentation Center), an archive of evidence of anti-Jewish persecution begun in 1943, and the Memorial of the Unknown Jewish Martyr, built in 1956. Hotel de Ville (Paris City Hall) was first constructed in the mid-14th century and was heavily reconstructed after the Franco-Prussian war in the late 19th century. Interestingly, this was formerly the square on which gruesome executions were held over many centuries—a disturbing historical legacy which is all but invisible and forgotten today. St-Gervais St-Protais Church displays a flamboyant blend of Gothic and neoclassical design; it was built on the site of a 6th-century basilica. The Place de la Bastille is shared by 4th, 11th, and 12th arrondissements and it is a lovely square where the famous Bastille prison once stood. Concerts, cafes, bars, and nightclubs make the Bastille square a much friendlier place these days. The Île Saint-Louis neighborhood is the small island situated on the Seine River south of the main island of Paris. Notre Dame Cathedral is one of the world's most famous places of worship. Immortalized in Victor Hugo's The Hunchback of Notre Dame, the breathtaking high-Gothic cathedral was built between the 12th to 14th centuries. Its remarkable front rose window, dramatic spires and iconic gargoyles emblematize Paris at least as much as the Eiffel Tower does, for many visitors. A visit to the archaeological crypt can extend your visit and offer insight into the medieval roots of Paris. The Ile de la Cite is a natural island on the Seine where a Celtic tribe, the Parisii, originally settled in the 3rd century BC. Seine River Booksellers stand out. Over 200 independent booksellers (or Bouquinistes) are located in Paris, and many are scattered along the right bank of the Seine from the Pont Marie to the Louvre, and the left bank from Quai de la Tournelle to Quai Voltaire.